Words on a blog cannot rightfully express what it feels like to final have our Cherokee 235 officially home in it's new hangar in Eugene...I want to shout it to the world. I first laid eyes on airplanes at age 10, and knew someday I would not only fly those crazy flying machines, but also own one. When you do the math, that is 41 years from those fence-hanging days to yesterday, when I finally made it home with our new plane. After signing papers on October 6th, I spent the best part of last week trying to figure out a way to get the plane up here, as weather was low minimums and crud all week. But magically, as soon as Julie cashed in some of our miles and arranged for Alaska Airlines to give us two free tickets into LAX, the weather Gods understood the severity of the situation and ordered up clear skies for yesterday, the 13th...my REALLY lucky day. The flight into LAX was a non-issue, Alaska today remains one of my favorite airlines. After dodging cement trucks and clowns on a long list of unnamed freeways from hell, the old owner of 27W delivered Jim and I to his hangar. As he pulled his plane out of the hangar for the last time, I felt kind of sorry for the guy. He is a very good dude, and it has been plain to see throughout this deal that he loved 27W very much. If anyone needed proof that we develop personal relationships with our planes, look no further than our airplane's previous owner. It must be a helluva good bird if he had this much trouble giving it up. 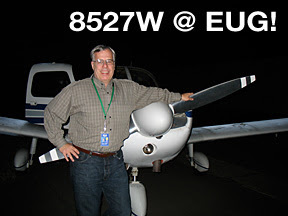 CFI Jim had filed IFR for us to Redding, and Whiteman Airport was maybe 2000 overcast. After a very good pre-flight, Jim and I pile in, stow our gear, plug in our mismatched headsets and fire up. Once the Lycoming 0-540 was purring, we soon noticed the SoftComm intercom HATED his stereo David Clarks and my mono Telex headsets. We fiddled and fussed, and shut down. Twenty minutes later, we resolved the deal, fired up again, and headed for Oregon...sort of. We had filed direct Gorman VOR, V23 to Redding. What they gave us was some sort of "unpublished" IFR departure out of Whiteman, real bizarro world stuff. Maybe if they had PUBLISHED it, the route would not have been a surprise to my zillion hour ATP CFI! So instead of direct GMN, we are sent into a series of 360-degree climbing left turns up through the clouds! From this day forward, I can now say that the very first 10 minutes of my time logged at the controls of 27W were a test of full-tilt IFR maneuvering in IMC, climbing AND turning...whew. Just as I my head entered the clouds, Jim smoothly told me to "fly it just like it was your PC simulator." And damn if he wasn't right on about that, as I flew easily to IFR practical test standards...just like I was pushing X-Plane through simulated weather. Next up, we find out the S-Tec autopilot is screwed up...holds altitude but not course from the GPS or NAV 1. I'm pissed, but with six hours of hand flying to IFR standards in front of me, no time now to be angry. So we cruise along happily at 65 percent power at a true airspeed of about 125 knots. We glide over Fresno, where my love of aviation began, and eventually set up for the ILS 34 approach into RDD. I am amazed at how stable the 235 is in all phases of flight. Shave off a few RPMs, and the Cherokee settles into a smooth 750-1,000 fpm descent...no trimming needed. On each step-down and level-off, I add power back in, and the plane responds with perfect no trim return to 125-130 knots straight and level. Somehow, I missed learning this wonderful technique in all the Cessna products I have piloted, where I had grown quite used to continuously spinning the trim wheel of misfortune with ever power change. But 27W is like nothing I have ever flown...she feels like a little airliner slipping down the glide slope. I am in LOVE now. After a few appetizers in the lounge at Peter Chu's, I am initiated into the plane ownership world when I see my VISA get dinged $278 for 58 gallons of highly-refined dead dinosaurs. Ouch. I have just witnessed the major difference between renting a "wet" aircraft, and owning a dry one. We continue to slide north, and I marvel that the setting sun looks perfect from our perch level at ten grand. Approaching EUG, we again get stepped down, and I love being in the IFR environment. This is MY airspace, buddy, keep your bubble away from mine! It is officially "night", the post lights are glowing, and the weather is right at 3 miles in haze. The only approach from the south is a VOR/DME, and without DME, we choose to continue on to a visual approach to the big commercial runway, 34L. It is lit up like Disneyland on the Fourth of July, and the sequential lights of the "rabbit" are pointing the way home. The remarkably courteous controller (hey, this IS Eugene, what else would you expect?) dims the runway lights, which to my IFR rookie eye are still plenty bright enough to allow Stevie Wonder to grease in a 747. In a second, I taxi up to 27W's new home, and shut down. My lovely wife meets us (with the dog, and NO he's not getting an airplane ride any time soon) and snaps a few pictures. We gently ease the Cherokee into it's new hangar, making sure not to rearrange the walls with the stabilator. My face hurts from smiling, and after 6.9 hours hand-flying to IFR standards, we go home and I collapse in an exhausted heap. Inside, I am giggling uncontrollably, but the exterior of this private pilot shows the wear and tear of the hardest, longest day of my 11-year flying career. It is done, we are home, it is ours. And it feels as good as I thought it would.